Those who have already read one or both of Dan Roam’s previous books, The Back of the Napkin and Unfolding the Napkin, will be pleased to know that in his latest book, he develops some of his most valuable insights in much greater depth but also expands the scope of his analysis to include new issues and new challenges as well as new opportunities to communicate more effectively. Of even greater significance, at least to me, he explains with exceptional precision and clarity the interdependence of verbal and visual literacy. In the first “Napkin” book, Roam suggests to his reader that one of the best ways to answer a question, solve a problem, persuade others, or to achieve another goal is to express its essence. What the French characterize as a precís. For example, formulate it as a simple drawing. You may claim that you have no skills for drawing. That’s good news. Why? Roam asserts that less-sophisticated drawings have greater impact because those who see them can more easily identify with stick figures, for example, and focus more readily on the relationships suggested, such as between and among options to be considered, implications and consequences, and cause-and-effect relationships. Simple drawings accelerate both inductive and deductive reasoning. 1. There is no more powerful way to discover a new idea than to draw a simple picture. 2. There is no faster way to develop and test an idea than to draw a simple picture. 3. There is no more effective way to share an idea with other people than to draw a simple picture. 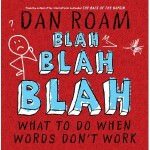 In both “Napkin” books, Roam explains how to achieve these objectives by (you guessed it) drawing a series of simple pictures. “To complete the workshop, you’ll need three things…This book is your primary tool; please expect to draw in it and generally muck it up – that’s what it’s for. [Also,] please bring your own magic wand with you to class. My own favorites are a plain no. 2 pencil, a Sharpie, or a Pilot pen.” Although Roam encourages his reader to use the book as a workbook and add annotations throughout, he also suggests using something to draw on, everything from several pages of blank scratch paper provided at the back of the book to a small personal whiteboard (i.e. small “lap board”). My own preference is the “Original Marble Cover 50-Sheets” composition book that costs less than $2 each. Whereas The Back of the Napkin introduces the core concepts of the visual problem-solving process, Unfolding the Napkin develops and extends the same concepts to wider, deeper, and more valuable applications. Yes, Roam really does take a “hands-on” approach…and the hands belong to his reader. 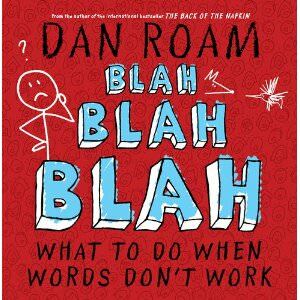 What we have in Blah Blah Blah is a shift in focus from using simple drawings to express complicated concepts to a rigorous explanation of how to avoid or eliminate boredom in communication. More specifically, how to think more effectively about complexities, how to increase one’s understanding of them, how to increase others’ understanding of them when we explain them, and how to make learning about them more engaging. To a much greater extent than in the previous two books, Roam includes a full complement of tools and techniques by which the reader can (a) select information, insights, and suggestions that are most relevant to her or his specific needs and interests, then (b) apply them most effectively where they will have the greatest impact. These and tools and techniques can help anyone to think clearly and explain convincingly in ways and to an extent most of us do not realize. With regard to the subtitle of this book and its reference to words that “don’t work,” it important to keep in mind that in order to understand visual literacy and verbal literacy, it is necessary to understand the vocabulary of each as well as the “grammar” of both whenever they interact. Drawings on cave walls thousands of years ago did not have captions but were presumably recognizable to those who saw them as were tone of voice and gestures (i.e. body language). We need to recapture once again, Roam suggests, the ability to grasp the essence of a thought, to overcome the complexity of “clutter,” then select words and images that express an idea so clearly and so compellingly that when sharing it with others, they care as much about it as we do. Bob Morris is an independent management consultant based in Dallas who specializes in accelerated executive development. He has also reviewed more than 2,200 business books for Amazon.Each week, we will add to the Networlding Business Bookshelfabbreviated versions in which he discusses a few of his personal favorites. You can contact him directly at [email protected].